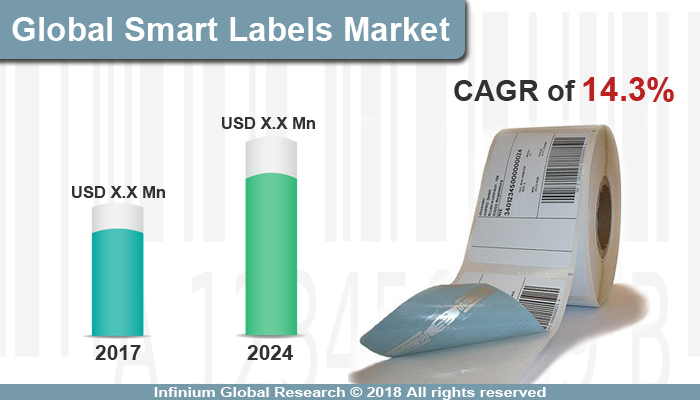 A recent report published by Infinium Global Research on smart labels market provides in-depth analysis of segments and sub-segments in the global as well as regional smart labels market. The study also highlights the impact of drivers, restraints, and macro indicators on the global and regional smart labels market over the short term as well as long term. The report is a comprehensive presentation of trends, forecast and dollar values of global smart labels market. According to the report, the global smart labels market is projected to grow at a CAGR of 14.3% over the forecast period of 2018-2024. A smart label is a flat electronic identification slip that contains more advanced technologies than conventional bar code data. These low profile transponders provide the ability to scan inventory without line-of-sight access. Smart labels consist of a printed battery, circuit, and an antenna combined with a microchip. Smart labels are becoming enormously important both socially and in terms of business potential. It extracts the data from the label that is used for inventory optimization, supply chain connectivity, to prevent counterfeiting and increase consumer engagement. The smart labels use several types of technologies such as Radio Frequency Identification (RFID), Electronic Article Surveillance Labels (EAS), NFC tags, sensing and dynamic display labels. The RFID tags are the most commonly used technology among smart label technologies. The reduction in inventory damage and revenue loss is the primary reason for the growth of the smart label market. RFID tags change the way stores track inventory and deal with loss prevention. Smart labels are an intelligent and interactive technology that is changing the labels and packaging landscape. Furthermore, they are used in several end-use industries owing to the various benefits offered by smart labels. The smart labels offer various benefits such as prevention against counterfeiting and theft protection, simple functionality, and reliability. Smart labels provide easy and instantaneous access to detailed information about several products such as food, beverage, personal care, household, and pet care products. They are most commonly used for packaging in electronics, healthcare and apparel industry. However, the low mechanical susceptibility of the smart labels and higher installation cost hampers the growth of this market. Moreover, growing penetration of smart labels in assets and merchandises tracking creates further opportunities for the growth of the smart label market. In addition, smart labels are being widely implemented in the FMCG industries owing to the recent developments in the IoT in industries. Among the geographies, Europe dominates the global smart label market. Smart labels are widely being used in the food and packaging industries in European countries such as the United Kingdom and the Netherland. Additionally, EU Framework Programmed for Research and Innovation provides funds for developing novel intelligent labels for food products, promoting the influence of smart labels application on waste reduction, food quality, and safety in the European market. The North America region holds the maximum market share after Europe owing to rising demand for secure and cost-effective inventory management from end-user industries. The presence of key players in the smart label such as Avery Dennison Corporation, William Frick & Company, and several others drives the growth of the smart label market in this region. Asia Pacific smart label market is set to grow with an incredible pace owing to the growth of several industries in this region. The report on global smart labels market covers segments such as technology, application, and end-user. On the basis of technology, the sub-markets include RFID, electronic article surveillance labels (EAS), sensing labels, NFC tags, and dynamic display labels. On the basis of application, the sub-markets include retail inventory, perishable goods, pallets tracking, electronic & IT assets, equipment, and others. On the basis of end-user, the sub-markets include retail, FMCG, logistics, automotive, manufacturing, aerospace, healthcare, postal services, and construction. The report provides profiles of the companies in the market such as Toshiba Global Commerce Solutions, Inc, Muhlbauer Holding Ag & Co., Smartrac N.V., Alien Technology, Inc., Invengo Information Technology Co. Ltd., Checkpoint Systems, CCL Industries Inc, Avery Dennison Corporation, Intermec Inc., and William Frick & Company. The report provides deep insights into the demand forecasts, market trends, and micro and macro indicators. In addition, this report provides insights into the factors that are driving and restraining the growth in this market. Moreover, The IGR-Growth Matrix analysis given in the report brings an insight into the investment areas that existing or new market players can consider. The report provides insights into the market using analytical tools such as Porter's five forces analysis and DRO analysis of smart labels market. Moreover, the study highlights current market trends and provides forecast from 2018-2024. We also have highlighted future trends in the market that will affect the demand during the forecast period. Moreover, the competitive analysis given in each regional market brings an insight into the market share of the leading players.